Before learning how to make creme brulee recipes, let us look at what “brulee” means. The cream part is a creamy smooth custard made with milk to heavy cream and eggs. After cooking the custard it is strained to remove all lumps making a very smooth texture. Then the custard is poured into an ovenproof dish, small dishes or ramekins. Most recipes instruct you to place in the oven and bake for a short time to set. After cooling to room temperature it is placed in the refrigerator until cold. The “brulee” is what makes this special unique dessert. 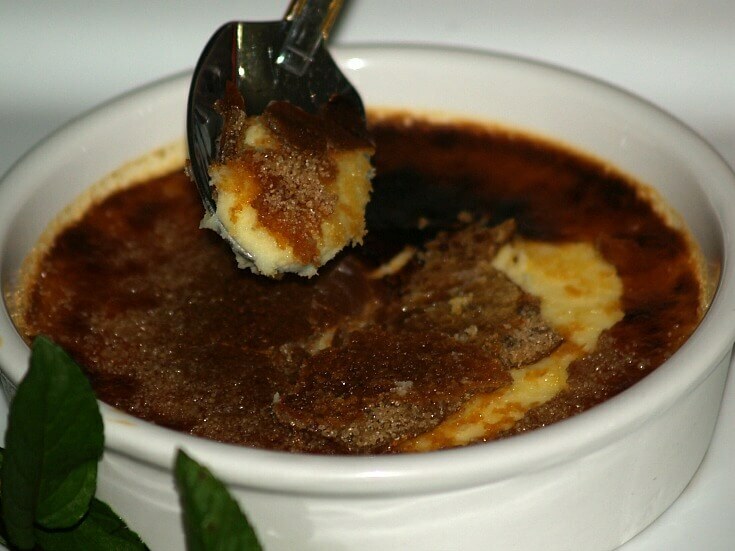 When learning how to make creme brulee recipes, it is important to know that “brulee” means burnt or broiled. (You actually DO NOT want to burn the sugar).The “brulee” is what makes this special unique dessert. Sugar, either white granulated or brown sugar is spread over the surface of the cold custard (Still in the ovenproof dishes). Your recipe will instruct you to how much sugar to use but it is usually about one-sixteenth inch thick. Now it is ready to “brulee” and this can be done by difference means. As you learn how to make creme brulee recipes, no doubt you will find a technique which you are the most comfortable. Traditionally, a small blow torch is kept on hand for recipes like these. Once you get use to this process, it is amazingly easy. Cover the edges of the bowls before starting. Place the flame over the surface only for a few seconds until the sugar is evenly browned. NOTE: After the “brulee” or melting the sugar, place the dessert back in refrigerator to keep cold. 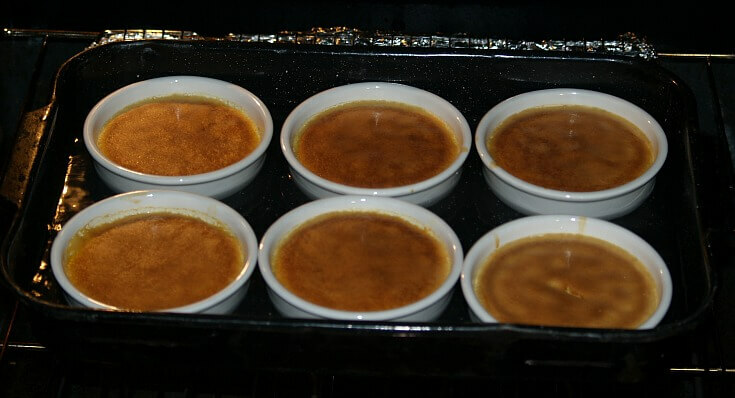 Using the oven broiler is another common way to “brulee”. Preheat the broiler on the highest setting. Place the dishes under broiler turning to brown evenly. I place small dishes on baking sheet under so they can all be removed quickly when lightly browned. This needs to be done quickly so the custard does not softened. The dishes needs to immediately be placed back in the refrigerator. I have read that some have packed ice around the dishes in a shallow pan before placing under the broiler to keep the custard firm. If the custard is very cold and firm and you work quickly, I do not thick the ice is necessary. A salamander can also be used for the brulee. I have never used this technique but I understand there is a unit like a small broiler oven. A salander also comes in a flat iron with a wooden handle. After heating to “red hot” it is moved over the surface of the custard, without touching, until the sugar melts and is evenly browned. An alternative technique when learning how to make creme brulee recipes is by melting the sugar, cooling and then placing it on top of the dessert. For this technique, draw circles the size of the top of your dishes on foil lined tray. Oil the circles lightly and spread with the sugar. Melt the sugar by any of the above methods. Cool circles until firm and then place circles on top of desserts before serving. Learn how to make creme brulee recipes with this easy recipe. It requires no cooking only place under broiler a couple of minutes. Arrange fruit in 1 quart heat proof casserole dish. Spoon half and half over the fresh fruit; chill at least 1 hour. Sprinkle sugar evenly over top of the half and half. Place under hot broiler for 1 to 2 minutes until sugar is caramelized. Garnish with fresh mint before serving. LEARN HOW TO MAKE CREME BRULEE RECIPES by first cooking a creamy custard with the following recipes. Learn how to make creme brulee recipes and serve with fresh fruit. In 2 quart saucepan whisk together the egg yolks and sugar. Heat cream in 1 quart saucepan until tiny bubbles start around the edge. Slowly add hot cream into yolk mixture while whisking. Cook over medium heat stirring constantly until mixture coats back of spoon about 15 minutes. Stir in vanilla; pour mixture into 1 ½ quart heat proof casserole dish. PREHEAT BROILER; sift brown sugar over top of chilled mixture. Place under hot broiler until sugar melts about 3 minutes; refrigerate. Place casserole on a large tray; surround it with the mixed fresh fruit. TO SERVE place a serving of the crème brulee and some fruit in each dish. 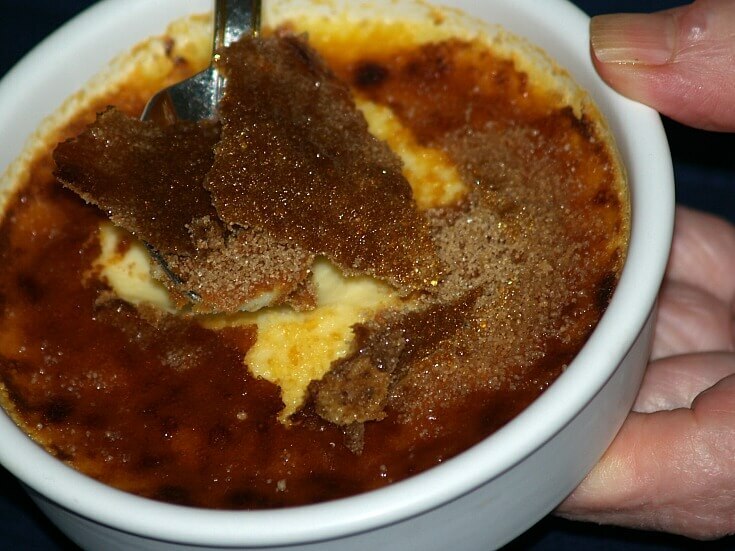 Learn how to make creme brulee recipes using Tobler Candy. Preheat oven to 325F degrees; Place oven rack 1/3 up from bottom of oven. Place six ramekins (1/2 cup each) in a shallow roasting pan. In a medium bowl combine together the yolks, sugar and peppermint. Beat on medium speed of mixer until thick and pale. Scald the cream; remove from heat and add the white chocolate stirring until smooth. Gradually pour cream mixture into yolk mixture stirring constantly. Skim foam off top of mixture; strain into 6 ramekins. Pour hot water in roasting pan half way up sides of ramekins; place in oven. Bake 30 to 35 minutes or until tip of knife inserted in center comes out clean. Move ramekins to an ovenproof tray. Cool to room temperature, cover with plastic wrap and refrigerate at least 4 hours. PREHEAT BROILER: sift 1 TEASPOON brown sugar over each ramekin. Place under hot broiler 30 to 60 seconds until sugar is caramelized; refrigerate. 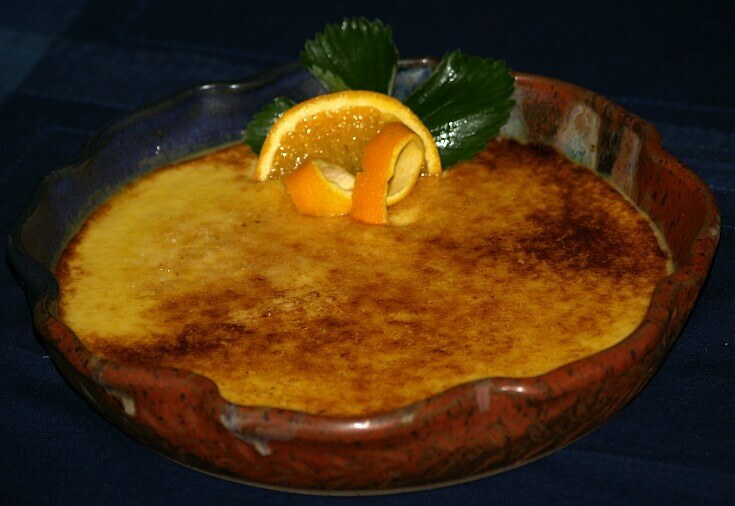 Learn how to make creme brulee recipes with orange flavor. Combine cream and orange zest in medium saucepan; bring just to a boil. Meanwhile whisk together yolks and 1 ½ cups sugar in top of double boiler. Whisk yolk mixture vigorously over simmering water until pale yellow and hot. Whisk the hot cream mixture into the hot yolks. Whisk and cook until thickened about 10 to 15 minutes. Place pan (cream mixture) in a bowl of ice water; whisk until cooled. OPTION: Layer berries in bottom of casserole dish under custard mixture. Strain the mixture into ovenproof dish; cover and refrigerate at least 4 hours. When ready to serve sprinkle 1 tablespoon sugar over the top. Place under hot broiler until lightly browned; refrigerate until ready to serve. Learn how to make creme brulee recipes with caramel flavor. In a small skillet over low heat melt ½ cup granulated sugar. Stir sugar constantly until lightly browned. Divide evenly into size (5 ounce) custard cups; tilt to coat bottoms and cool. Combine eggs and remaining ½ cup granulated sugar in medium bowl. Add salt, vanilla, milk and water; beat until blended but not frothy. Ladle mixture into prepared custard cups; set in shallow pan. Pour ½ inch of hot water in bottom of shallow pan. Bake 35 to 40 minutes until knife inserted ½ inch from edge comes out clean. Remove cups from hot water; let cool and refrigerate at least 2 hours. Sift brown sugar evenly over the top of custards. Place under hot broiler until sugar bubbles and melts. In medium saucepan blend cornstarch with ½ cup of the whipping cream. Stir in remaining 1 ½ cups of the cream and granulated sugar. Cook over low heat until tiny bubbles form around edge of pan. Stir constantly while cooking; remove from heat. Slowly stir hot mixture into beaten egg yolks until blended. Return mixture to saucepan; cook and stir until thickened (mixture coats back of spoon). Cool mixture slightly and stir in vanilla; pour into 4 ramekins (5 ounce size). Cool to room temperature and then refrigerate at least 3 hours until set. Sprinkle 2 tablespoons brown sugar over each ramekin. Place under hot broiler 2 to 3 minutes until sugar melts. Refrigerate 1 to 2 hours until caramel is hard. Immediately before serving, crack caramel with back of spoon. Learn how to make creme brulee recipes with vanilla bean. Beat egg yolks and salt until lemon color; set aside. Cut vanilla bean lengthwise scraping insides into a large heavy saucepan. Add cream to saucepan and scald; remove from heat. Whisk hot mixture into beaten egg yolks; strain into 10 inch shallow baking dish. Place dish in a large pan; pour hot water half way up sides of baking dish. Refrigerate about 6 hours until cold. Sift brown sugar evenly over top of custard making a layer about ¼ inch thick. Broil until top is caramelized turning dish to caramelize evenly. Refrigerate until serving; before serving crack caramel with back of spoon. Learn how to make creme brulee recipes with alternative flavors to choose. Combine cream, yolks, sugar and vanilla in medium bowl. Whisk until sugar is dissolved and mixture is smooth. Divide evenly into 5 individual baking dishes (5X1 inch). Place dishes in a shallow roasting pan; pour hot water to ½ inch depth. Bake 45 to 50 minutes until almost set. Remove from oven and let custards cool IN PAN of hot water. Remove dishes from water, dry bottoms, cover and refrigerate at least 8 hours. Sift brown sugar over top of custards; place on pan. Place pan of custards about 5 inches under broiler with door PARTIALLY OPEN. When brown sugar melts (About 3 minutes) remove from oven. Let set about 5 minutes for melted sugar to harden; garnish and serve. NOTE: If not ready to serve place in refrigerator; serves 5. CHOCOLATE CREME BRULEE: Combine 4 ounces semi sweet chocolate with ½ cup of the whipping cream from above recipe in small saucepan. Melt over low heat stirring until blended; set off heat. Add remaining whipping cream and DECREASE vanilla to 1 teaspoon. Proceed with basic recipe and bake for 55 minutes. FOR CHOCOLATE RASPBERRY creme brulee place 8 to 10 fresh raspberries in each dish before pouring in the custard. Increase baking time to 65 minutes. 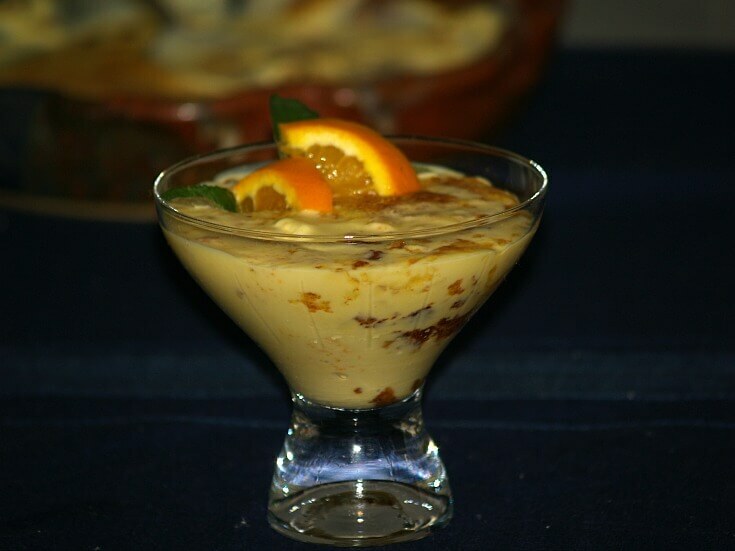 GINGER CREME BRULEE: Reduce vanilla to 1 teaspoon and add 2 tablespoons grated fresh ginger to the custard mixture. Proceed with the basic recipe and bake 65 minutes. WHITE CHOCOLATE MACADAMIA NUT CREME BRULEE: Combine 4 ounces white chocolate with ½ of the whipping cream from above recipe in small saucepan. Cook and stir over low heat until chocolate melts; set off heat. Add remaining whipping cream and DECREASE vanilla to 1 teaspoon. Proceed with basic recipe. Place 1 TABLESPOON toasted macadamia nuts in each dish before pouring custard. Bake 70 minutes. PEPPERMINT CREME BRULEE: Decrease vanilla to 1 teaspoon. Add 1 ADDITIONAL egg yolk and 3 TABLESPOONS peppermint schnapps. Proceed with basic recipe and bake 50 minutes. SUBSTITUTE the brown sugar with 5 hard peppermint CANDIES CRUSHED; broil as directed. Bring cream and ginger to a boil in a heavy medium size saucepan. Turn off the heat and let set 5 minutes to infuse the ginger. Mix the yolks, 1 cup sugar and vanilla in a medium bowl. Whisk the yolk mixture until sugar is dissolved and pale yellow. In a slow steady stream, whisk the hot mixture into the yolk mixture. NOTE: Whisk constantly while pouring to prevent curdling of eggs. Strain mixture through a fine sieve; PREHEAT OVEN TO 325F degrees. Place 12 ramekins (8 Ounce) in shallow baking pan. Fill ramekins with cream mixture to within ¼ inch of top. Add enough hot water to come halfway up sides of ramekins. Cover pan loosely with foil leaving ends tented. Place pan in oven; bake 25 minutes until center of brulee wiggles. Remove from oven; allow to cool for 15 minutes in the water. Remove ramekins from water; refrigerate for 4 to 6 hours until cold. 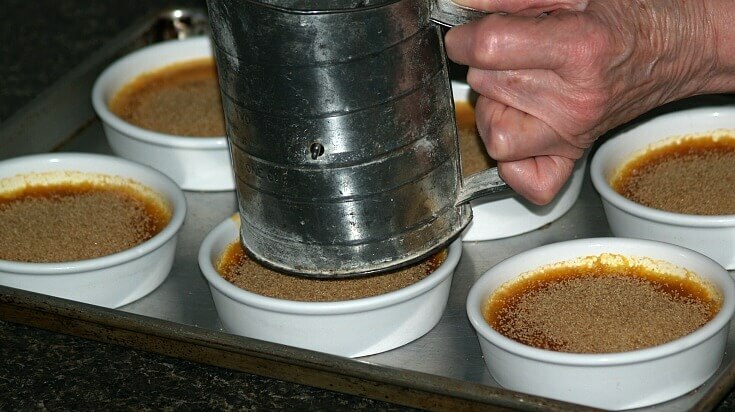 TO SERVE sprinkle sugar over tops of brulee. Place under the broiler until caramelized; remove and serve immediately.